I’m privileged to be part of this growing group of enthusiastic and hardworking young scientists making their mark in the interesting world of carnivore research. My previous research was predominantly on invertebrates; firstly with spiders on sub-Antarctic Marion Island for my Honours degree and then with invasive Argentine ants for my MSc at Stellenbosch University. Batties are therefore my very first encounter with the mammal world and my project is aimed at exploring both physiological and ecological factors influencing stress levels in female batties. While I look forward to sharing my experiences with you, I'm also thrilled to have been selected from a nationwide competition to blog about my PhD journey on SAYAS (http://sayasblog.com/). The breeding season has finally yielded excitement in the field as one of our very own, Bertha, had a litter of adorable pups! Perhaps even more surprising is the fact that no one saw it coming, least of all, not from Bertha, who is notoriously shy and showed no signs of pregnancy. The same cannot be said of Garbuncle, whose thick fur and mood swings got us fooled into thinking she was pregnant, but these “signs” turned out to be false alarms. The pups, who have been sheltering in dens, are now beginning to venture into the wild in search of food. The recent drought presents a major food challenge for both mom and pups, who can no longer be sustained by milk alone. As they wander far and wide in search for food, locating individuals to do focal behavioural studies on is getting a bit tricky as their territorial boundaries have expanded. It is no longer unusual to spot new and unfamiliar neighbours that roam right into our nightly sessions. Some of our “own” foxes, like Ilor, are even skipping reserve boundaries altogether and venturing deep into nearby farms. During a late night search for Bertha, I stumbled upon what at first looked like a wild cat, bouncing about in the bushes like a ping pong ball. It was only when it stopped and peered intently at me with small black eyes that I realized it was a pup! I had not seen any of them until now and needless to say, it was love at first sight. Soon enough, I found myself surrounded by three pups and their mom, all eager for some raisins. Ears that only a mother could love? I could see a new (thesis) chapter unfolding right before my eyes, as several questions came to mind: how are they coping in this climate of drought? Given that lactation is likely to increase Bertha’s nutritional requirements, how does her feeding frequency and meal constituent compare to her pre-maternal state? Feeding demands made by pups will no doubt influence her feeding patterns. I now have the opportunity to investigate these and more; such as the quality of maternal care, by noting down factors (grooming, nursing/feeding, ‘pup-protection’ etc) that will help me answer these questions. Sadly, all my proverbial eggs are in one basket for now — Bertha’s. I will be keeping a close tab on Bertha and her brood for the next couple of months as I get more acquainted with the pups. This entry was posted in bat-eared foxes, field biology, foxes, Kalahari, Keafon Jumbam, maternal care, Otocyon and tagged bat-eared fox, canids, Kalahari, maternal care, parenthood, pups on February 13, 2015 by Keafon. My first week has been filled with many batty experiences as I followed Ruan around the Reserve. As I entered my second week, it became time to cut loose the apron strings and put what I’ve learned into practice by going solo. I was very excited but also nervous; will I be able to spot them amongst the tall grasses in the field? Will I recognize the different individuals? Do I still recall their foraging spots and how to get there? Will I even remember my way back to home base? For my first task, I was assigned two of the most ‘easy going’ individuals: Bruce and Donna. With the use of a VHF antenna receiver, I was able to track Bruce within 10mins, and he happily came running towards me as if to say welcome. I was glad my first session had gotten off to an easy start. But not for long, because thirty minutes into the session, a herd of cattle came rushing down our way, heading for a nearby watering hole. They stopped in their tracks when they saw me and glared rather angrily, because Bruce and I were clearly in their way. These are not domesticated animals, and there were several calves in the herd – another cause for concern, because their horned mothers can protect them quite aggressively. I needed to think fast. Losing Bruce was not an option, but I had to give way to this grumpy herd of cattle. The second I took a step to the side, the entire herd broke into a run, hurtling down the hill towards us! Bruce was startled and immediately took flight into the bushes. I too, took to my heels, searching my mind frantically for any cattle-defense lessons I might have come across. There were none, so I hid behind a tree as the herd rushed by and down to “Lake Victoria”. My heart was still racing minutes later, but calm was restored rather suddenly, as soon as the herd reached its goal. Bruce appeared far less disturbed than I was, and we spent a lovely evening together, not getting lost too badly, steering clear from the hoofed and horned animals on the reserve. 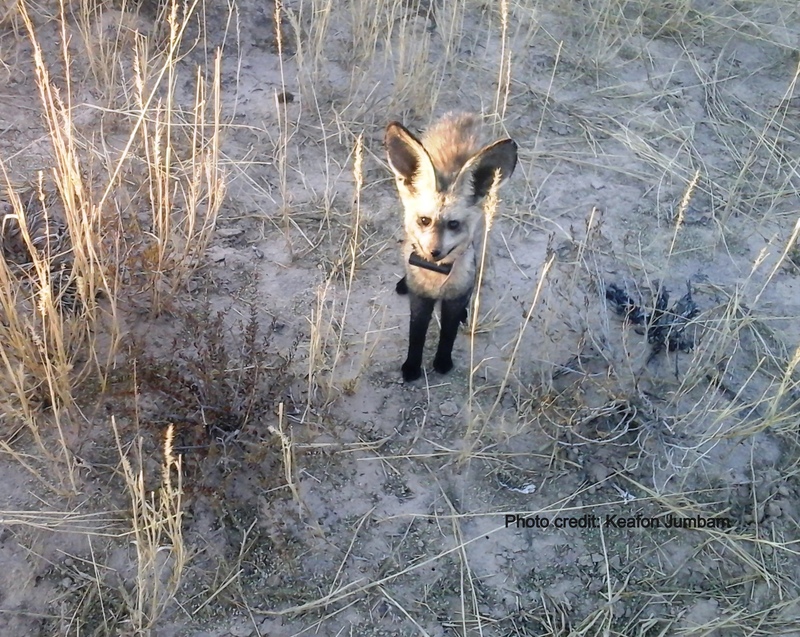 This entry was posted in bat-eared foxes, Kalahari, Keafon Jumbam, Otocyon, telemetry and tagged canids, foxes on August 27, 2014 by Keafon. Before my trip to the Kalahari, I was pretty happy to have an “easy” start to my research, because my colleagues had already habituated and radio-collared several bat-eared foxes, or batties, as they are fondly called. In my very first night in the Kalahari, we came across a batty standing in the middle of the road! This was going to be fun and I couldn’t wait to start with fieldwork the next day. What’s more, my colleague Ruan would be by my side to show me the ropes. So what was there to worry about? Well, I was soon to find out. The next day, we set out in search of batties and in my excitement, I did everything wrong: Firstly, I forgot to pack the most essential fieldtrip equipment: a GPS and cooler bag for faecal samples. Then, I left my winter jacket in the car … we are in the heart of winter and temperatures plummet to sub-zero degrees at night. At sunset, we spotted our first batch of animals at a water-holding spot optimistically called Lake Victoria. What a relief to finally see them up close and personal! But they all looked alike to me, apart from ‘Donna’ whose personality shone through as the grumpiest of them all. Fine, though, I was ready for this! Yet, in a few short minutes I realized data collection is not straightforward at night. How does one maintain speed with an animal sprinting across thorny thickets and slippery sand dunes, all the while carrying a loaded backpack, a Samsung tablet in one hand and a spotlight in the other? One thing is certain; I won’t need a gym membership card for the longest time to come! 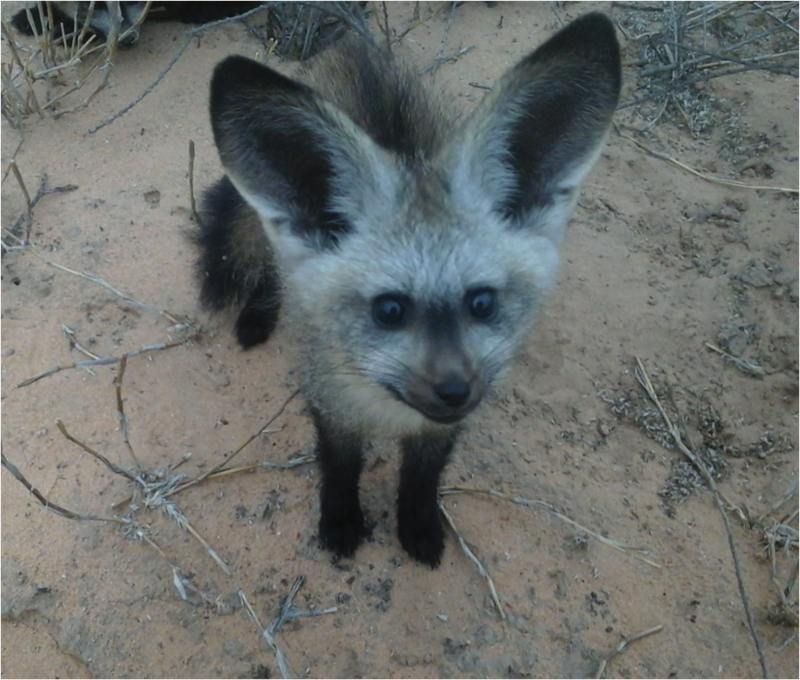 This entry was posted in bat-eared foxes, Kalahari, Keafon Jumbam, Otocyon and tagged bat-eared fox, ecology, foxes, Kalahari, Otocyon on August 8, 2014 by Keafon.